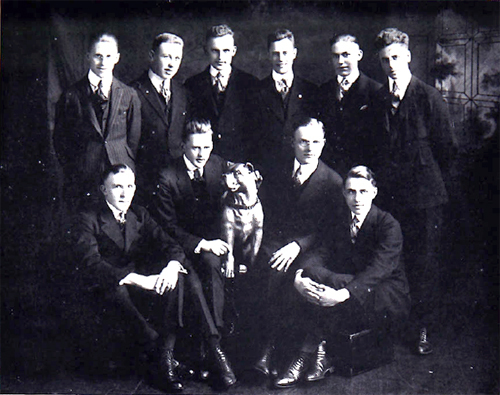 The Pi Upsilon Gamma fraternity was founded at Augustana College in 1916. The group and its members are colloquially referred to as "Pugs." The group was active on campus for several decades, participating in social events, sports, and service opportunities. Many Pi Upsilon Gamma members and alumni served in World War I and World War II. The "Pug Service Growler" was a newsletter distributed to PUG members and alumni during and immediately following World War II to update the membership on the wartime activities, locations, and deaths of members serving in the armed forces. Newsletters take the form of compilations of transcribed letters mailed to Pi Upsilon Gamma headquarters from men stationed in encampments in the United States and abroad.